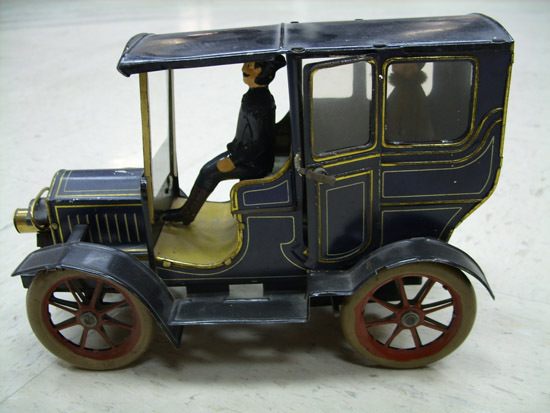 An Open Drive Limousine toy with artillery wheels, working door latches, a centrally mounted gas head lamp, with a chauffeur and lady passenger (wearing a pipe cleaner fox stole). Manufactured by Carette. 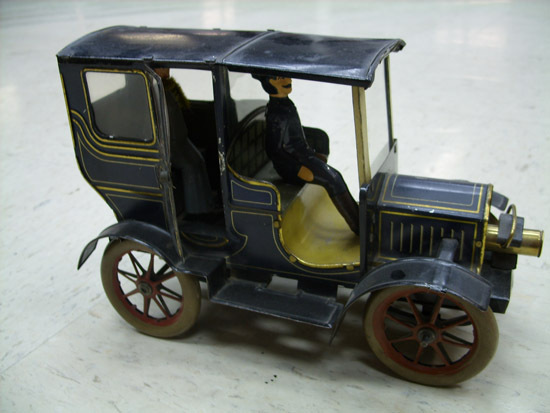 While identification of the pictured vehicle is tenuous, it strongly resembles a very early Mercedes. 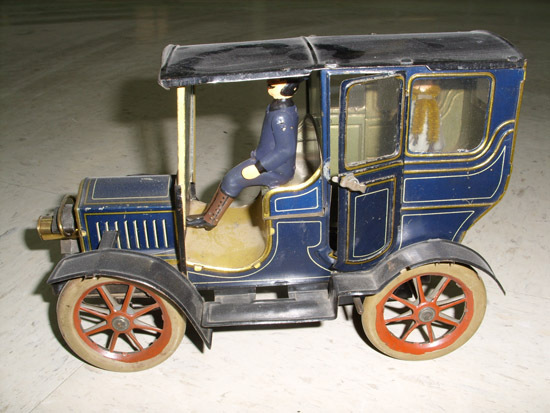 This rare all-tin motor is in exceptional original condition, with original paint and all fittings, plus a separate key for the wind-up motor that may have once belonged to another toy. The removable steering wheel and post assembly are designed to be wedged between the driver’s moveable arms. You can still do this for display purposes, but it would probably fall apart as the vehicle rolls. Circa 1909. It measures 10-inches” long by 4 and-3/4-inches” wide by 6 and- ¼-inches” tall. A few winds of the key (and a gentle nudge) and this Excellent condition toy will roll along nicely.